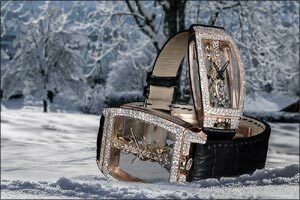 “Ultimately, each snow-set Golden Bridge is completely unique”, explains J�r�me Biard, CEO of Corum. “They are at once true Fine Watchmaking and Fine Jewellery pieces, and we will never make two which are identical. This covering reflects Corum’s philosophy of thinking outside the box, of breaking with convention, to offer our collectors a calibre that is completely unique, our baguette movement, and a highly exclusive setting that had almost never been used in Corum’s history”.